Bats are good neighbors to have around. A single brown bat can eat up to 1,000 mosquitoes in one hour. They are a great natural pest controller. You can help by providing bats with a nice bat house in your neighborhood. For a woodworking site with over 20 Free Bat House Plans , companies that sell quality bat houses and various bat house resources go to the previous bat house plans link. Bats like tight and warm spaces. They like it to be 80 to 100 degrees in July when they have their young with them. The bat house should be placed in the sun and around 12 to 15 feet off the ground to prevent predators from getting them. Important: Bat Conservation International suggests that you use water based paints to keep down paint odor that might repel bats. There are many designs and sizes of bat house plans listed below. Take a look at them to see which bat house you like. Bat Conservation International - is a non-profit organization based in Austin, Texas. They own Bracken Cave in Texas which is the summer home to between 20 to 30 million Mexican free-tailed bats. Their website has many great Bat House Resources including two Free Bat House Plans. They also have articles on installing and making successful Bat Houses. Most of their links are to PDF files. Free Single Chamber Bat House Plan! Free Four Chamber Bat House Plan! 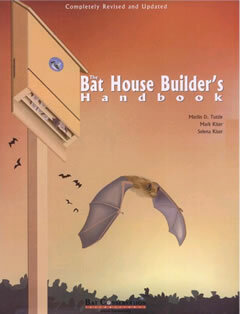 National Wildlife Federation - online bat house building guide. Great color pictures and detailed instructions for building a single chamber bat house in about 6 hours. U.S Fish & Wildlife Service Beneficial Bats - This PDF file (41 kb) has information about Building a 4 Chamber Bat House with illustrations, Bat Facts, Bat Food, Bats of the Southeast, and Attracting Bats. 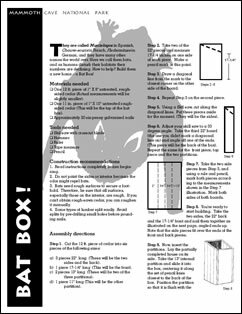 Bat House Construction Project - This page discusses constructing a bat house. Included with many pictures is how to build a bat house, materials needed and finally how to hang a bat house. Click on the pictures for larger images. Carlsbad Caverns National Park - Has an online Do-It-Yourself Bat House. The Buzbee Bat House Temperature Plot - this is a great site for links about bats. He has over 500 bat links. © 2006-2015. All rights reserved. We like the NPCA and the NPS but are not in any way affiliated with them.